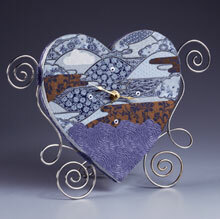 Impress everyone with this handmade paper crafted art clock that is easy and inexpensive to make. Your friend will never believe you didn't buy this paper clock from a fancy department store and you'll love knowing that you have a homemade clock decoration for your shelf or nightstand. Sheet, 12" x 12" x 1"
Trace heart pattern outline onto foam sheet, omitting dashed line. Flip pattern over to complete heart. Wax serrated knife with candle stub or paraffin; cut out heart. Smooth rough edges with fingertips. Use pencil to poke hole through center of heart as shown for clock mechanism. Refer to photo/pattern to cover heart with various papers. Trace heart onto wrong side of desired paper for front (landscape scene used here, marked "a"); cut 1 1/4" wide strips to cover sides. Glue strips to heart sides, folding excess over foam edges. Glue front cover in place; let dry. Next, trace, cut, and glue three "b" areas (brown/blue print shown here) to heart. Note: Pattern markings are for first side of heart only, and are only suggested shapes. Trace, cut, and glue scalloped "c" area to bottom of heart. Cut several 1/2"-wide strips from same paper to glue around heart edges. Trace and cut out "d" pattern from rice paper or similar translucent material; glue to heart. Let heart dry flat, pinning papers to foam to secure until glue dries. Use pliers to bend two wire arms and one wire stand as shown. When heart is dry, use glue gun to glue arms to heart as shown. Glue small paper pieces over wire to conceal glue. Cut a 2" square from paper of choice. Fold two edges to meet at center, to measure 1" x 2". Wrap paper around top, straight edge of wire stand; glue paper ends together, allowing wire to pivot freely. Hold heart upright on work surface to ensure proper placement of stand. Glue paper ends only to back of clock, below hole for mechanism; let dry. Glue one end of chain directly to foam below top of stand. Add jump ring to free end of chain and join to stand, connecting it just above intersection of wire ends. Follow manufacturer's instructions to insert clock mechanism. Glue beads into foam surface to mark quarter-hour positions. Purchased clock face or numerals may also be used.